Dhritarashtra said: O Sanjaya, after my sons and the sons of Pandu assembled in the place of pilgrimage at Kurukshetra, desiring to fight, what did they do?" I really feel for my ignorance of Sanskrit and not knowing the “ Bhagwad Gita” – the holiest of scriptures. How sinned are such people ! It is supreme knowledge – the words of Lord Krishna Himself !! – Srimad Bhagwad Gita contains 700 slokas and occurs in *BhishmaParva* of *Mahabharata*. Bhagvad Gita "is the manifest quintessence of all the teachings of Vedic scriptures." It is the only knowledge that can take mankind to real freedom and real success. Gita stipulates that real freedom is freedom from attachment, aversion, ego, greed, anger and fear. For Gita, real worship consists of doing one's duty with perfection without being distracted by thoughts of its outcome. Bhagwad Gita is the magic that can liberate us from all bondages, doubts, self-imposed limitations, anxieties and fears to lead happier, fuller, contented, peaceful and supremely successful lives. Detachment does not mean inaction or renunciation of action. Detachment means renunciation of expectation of reward of action. If one be devoted to the constant practice of the Gita, even though he be restrained by Prârabdha Karma, yet is he Mukta, happy, in this very world. life is not tainted by Karma. The knowledge as ascertained from Bhagwad Gita is the absolute knowledge, imperishable, eternal, of the essence of My inexpressible State, the Knowledge comprising the whole of the three Vedas, supremely blissful and consisting of the realisation of the true nature of the Self,—declared by the All-knowing and Blessed Krishna, through his own lips, to Arjuna. Bhagwad Gita is the journey of a despondent Arjuna who faced with the prospect of fighting his near and dear ones in the battle, has thrown away his weapons in the battlefield – to a self-assured Arjuna ready to fight. Lord inspired Arjuna to complete his goal is well known but we fail to understand the simple fact that we also can raise ourselves to nobler levels by reading and following Bhagwad Gita. The most profound spiritual preaching in the form of discourse of Supreme Lord Krishna Himself is the most popular and well known of all the sacred scriptures from ancient India. Always being revered as a true source of spiritual knowledge it reveals the purpose and goal of human existence. The eternal knowledge of Bhagawad Gita is freely available to everyone all over the Earth, to all those who seek… The direct audience to Lord Krishna’s discourse of the Bhagavad Gita included Arjuna (addressee), Sanjaya (using Divya Drishti (or divine vision) gifted by the sage Veda Vyasa to watch the war and narrate the events to Dhritarashtra), spirit of Lord Hanuman (perched atop Arjuna’s chariot) in his flag and Barbarika, son of Ghatotkacha, who also witnessed the complete 18 days of action at Kurukshetra. The Bhagavad Gita is also called Gītopaniṣad, implying its having the status of an Upanishad, i.e. a Vedantic scripture. 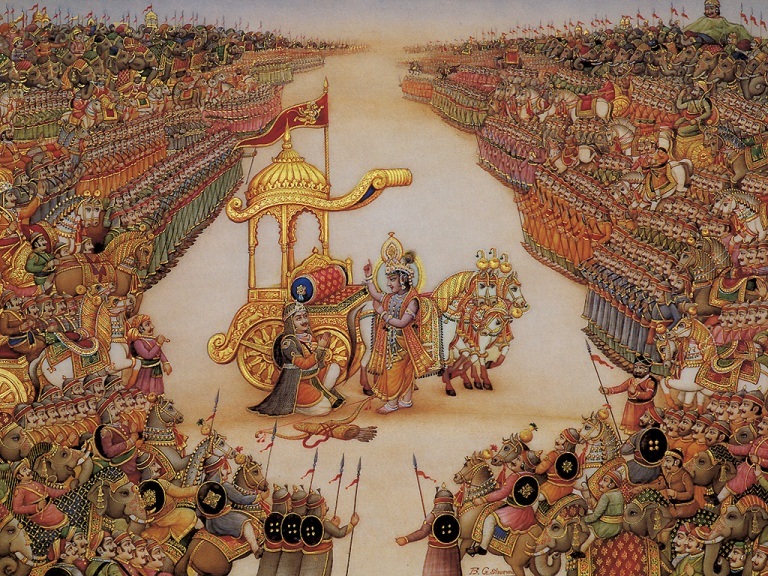 The Gita consists of eighteen chapters in total: the first is Visada Yoga – where Arjuna requests Krishna to move his chariot between the two armies. When Arjuna sees his relatives on the opposing army side of the Kurus, he loses morale and decides not to fight. The last is the Moksa-Upadesa Yoga: In conclusion, Krishna asks Arjuna to abandon all forms of dharma and simply surrender unto him. He describes this as the ultimate perfection of life. You might have heard of Duma – of the various representative assemblies in modern Russia. Tomsk is governed by a mayor and a 33-member city Duma. ………… and Tomsk is in news for wrong reasons…..
Tomsk located on Tom river is one of the oldest towns in Siberia. A court in Siberia’s Tomsk city is set to deliver its final verdict, in a case filed by state prosecutors. The final pronouncement in the case will come two days after Indian Prime Minister Manmohan Singh, during his December 15-17 official visit for a bilateral summit with Russian President Dmitry Medvedev, consolidated bilateral trade and strategic ties and personal friendship.The case, which has been going on in Tomsk court since June, seeks a ban on a Russian translation of the “Bhagavad Gita As It Is” written by A C Bhaktivedanta Swami Prabhupada, the founder of the International Society for Krishna Consciousness (Iskcon). It also wants the Hindu religious text banned in Russia and declared a literature spreading “social discord”, its distribution on Russian soil rendered illegal. In view of the case, Indians settled in Moscow, numbering about 15,000, and followers of the Iskcon religious movement have appealed to Manmohan Singh and his government to intervene diplomatically to resolve the issue in favour of the scripture, an important part of Indian epic “Mahabharata” written by sage Ved Vyas. Iskcon followers in Russia fear that the religious freedom of Hindus living there would be compromised. The court, which took up the case filed by the state prosecutors, had referred the book to the Tomsk State University for "an expert" examination Oct 25. Hindu groups in Russia, particularly followers of ISKCON, say the university was not qualified as it lacked Indologists who study the history and cultures, languages, and literature of the Indian subcontinent. The Hindus pleaded with the court that the case was inspired by religious bias and intolerance from a "majority religious group in Russia", and have sought that their rights to practice their religious beliefs be upheld. The prosecutor's case also seeks to ban the preachings of Prabhupada and ISKCON's religious beliefs, claiming these were "extremist" in nature and preached "hatred" of other religious beliefs. "They have not just tried to get the Bhagavad Gita banned, but also brand our religious beliefs and preachings as extremist," Das said. In the Nov 1 letter addressed to Principal Secretary to the Prime Minister Pulok Chatterji, ISKCON's New Delhi branch Governing Body Commissioner Gopal Krishna Goswami, said the prosecutor's affidavit claims Lord Krishna "is evil and not conforming to Christian religious view". A book can be banned – but the greatness of BHADWAD GITA cannot be undermined by any Court rulings……. The issue here is not about believing or respecting a particular religion. In my view, all religions are illogical but banning any religious book such as the Gita is apalling! A person has as much of a right to read the Bible, Kuran or Gita or any book trashing religions. The issue is about people having the right to read, discuss and propagate whatever belief or faith that they belong to, in a country which claims to be a secular democracy! And Russia is a self professed democratic country. A banning of religious non-Is1amic texts in a country like Saudi Arabia or Iran or any particular religious texts in North Korea or China would not be a surprise, as they are all TOTALITARIAN regimes! The Russians have to walk the talk when they talk about being a full fledged democracy and a long time ally of India!